개요: Adam and Eve; life of Jesus, believe in Him. In the beginning, God made all things. He made the world, the stars, the sun and moon. He made the trees, birds and animals. Afterwards God made a man and a woman, named Adam and Eve. They were altogether good. They loved to obey and please God. Then one day Satan came to them. Satan is the one who rules over all that is evil. Adam and Eve listened to Satan and obeyed his words. When they did this they turned away from God. They disobeyed God. Satan put evil thoughts into their hearts. They were no longer good as before. Adam and Eve refused God's Word, and after that all men and women who were born, also disobeyed God. All have followed the words of Satan. God felt great sorrow and pity for all men and women. Why did He pity them? Because He knew that after they died, all who followed Satan would go to the place of Satan. This place is a place of darkness and pain. God loved all men and women everywhere. There was only one way to help them. God would free them from Satan's power. How would God do this? How would He help them? He would send His Son into the world. His name is Jesus. Jesus did not have one sin. He was altogether good. He lived with God in heaven, where it is only good. Jesus left His place in heaven and came to live among men and women. He was born on earth. Jesus is truly God, and He also became a man. Jesus taught people about God. He did mighty works. Everyone saw that His words were true. But one day, Jesus was killed on a cross. Why did He die? He died to bear our punishment for our sins. And He died to break the power of Satan, who holds us fast in sin. After Jesus died, they buried Him. But He did not remain in the grave. On the third day He rose again and all saw that He was alive. 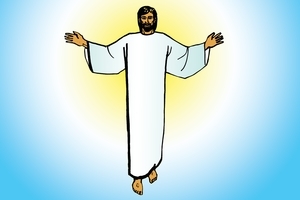 After a few weeks, Jesus returned to heaven to His place with His Father God. His work was finished. Now He says to you and me, "I am strong to save you. I am able to set you free from following Satan. When you choose to turn to Me, I will change your bad heart and give you a heart that can love God and obey Him. Receive Me and you can belong to Me. All who follow Me can go to the place I have made for them in heaven. They will not have to go to the place of fire with Satan." Jesus says, "Follow Me and I will give you life that never ends. When you die I will take you to My good place." GRN has recorded a version of this script in 264 languages and dialects. See full list.